The YOO.MEE High Pressure is our pick for the best shower head, which has a good pressure of about 2.5 gpm or gallons per minute. There is a flow restrictor on the handle so you can adjust the jets on how much water comes out of it. The fixture also has 3 functions to choose from, and works well even for low water pressure homes. Our step-up pick is the Hydroluxe Full Chrome and this one has over 5 settings to choose from. It has a chrome finish and has a 5-foot hose. There are two heads in one product so you get two detachable ones, both easy to operate and to install. It has a 3-way water diverter and a diameter of 4 inches each. The budget pick is the AquaDance High Pressure and this one has a total of 6 settings, has a diameter of 3.5 inches for the face, and has a chrome finish. Its overhead bracket can be easily adjusted on the angle, and the whole thing is easy to install due to the tool-free connections. Showerheads are important bathroom accessories. A shower head is either a detachable or fixed shower piece in a bathroom. It is a bathroom fixture that can be installed to your home, as long as you have a decent water connection. This is because shower systems need sufficient water pressure in order to work properly. Therefore, if you live on a high area, water might need to be drawn upwards with a motor. Detachable ones are ideal for when you want a thorough rinsing routine when you take a bath. 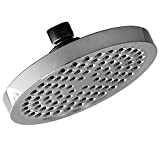 The detachable one is usually like a garden hose but with perforations much like a regular shower head. It is also similar to the rinsing equipments used in bidet systems. They can be more expensive than the fixed once, so they will only be mostly found in higher end homes and hotels. Fixed ones are ideal for public bathrooms or smaller homes, since they are cheaper and easier to install. These kinds of systems cannot be taken out from where they are installed, hence they only burst water in one direction, making them less effective for rinsing. Certain jet types will have an effect to your rinsing techniques. Jet types can help rinse your hair properly because of the pressure and how the jet goes through the holes of the shower head. Therefore, you must consider the jet type if you want a specific pressure for your bathroom fixture to be more effective. Fixture finishes can make a difference in aesthetics. The finish should definitely match your other bathroom fixtures. Finishes are secondary to function, but no one would take a shower on something that looks dull and lifeless on its finish. If you mostly have brass fixtures in your bathroom or comfort room, then you should definitely consider a brass shower head as well. If you don’t know how to properly install the bathroom fixture, you should consult an expert or a plumber. These people have the knowledge in water connections, pipelines, water pressure capability and the like. Do remember that your local plumber may advise you to have a motor pump for a shower system in case the water pressure in your existing connection is not enough to spray bursts of water. 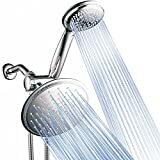 Detachable or fixed: it is important to know whether your shower head is fixed or detachable. Fixed ones are easier to install and are generally cheaper, but cannot effectively clean and rinse certain parts of your body. On the other hand, detachable ones, like the ones you see in bidet systems, can be flexible to use, but may require additional fixtures to be installed, and can be slightly pricier. Number of settings: most will have up to 6 settings or more. These settings may play a vital role to a customizable showering experience for you and the people at home. Settings can usually be changed in higher end bath fixtures, but not on cheaper ones. Number of jets: most will have 1 to 6 shower head jets. The jets play an important role to the bath fixture, since it will pour out the water in a specific pressure. Therefore, if you do want more pressure for your bathroom fixture and your bath time, you should consider more shower jets in the installation as much as possible. Setting types: you can choose between different settings, such as flood, full, massage, pause and rain. These settings can help you identify the type of showering effect that you want to achieve. Massage type settings are ideal for when you want to achieve a certain therapeutic head or body massage with the use of water. Shape: the shape matters in choosing, as one can be oval, square, rectangular or round. Oval and round ones are more common as a bathroom fixture, but there are also uniquely shaped rectangular ones and square ones, which could be the talk of the house guests. It may also add some aesthetics to your bathroom fixture and the bathroom as a whole as well. Finish: most will have a good finish so that it will not only look attractive, but will also be more durable. Common finishes include brass, chrome, bronze, copper, gold, nickel, stainless steel, platinum, biscuit, white, black, nickel and many more. You should match the bathroom fixture with the other ones in your bathroom. For instance, if you have used gold finishing in most of your bathroom fixtures, then it should be gold or close. As our top pick, the YOO.MEE High Pressure is a high pressure handheld unit that is equipped with a total of 3 functions, so that you can choose your preferred water dripping settings depending on your personal preference. It comes with the bracket and Teflon tape so that it is easy to install right off the bat, when you want to attach it to your bathroom and easily screw it onto the existing pipe. In addition to the given settings, it even has a pulsating setting so that you will feel as if you are getting a head massage or back massage with the pressure of the water. It also has a beautiful chrome finish so that you will probably get it to complement your other bathroom fixtures out there. In addition to that, it even boosts water pressure, despite the fact that you might have low pressure water connection. With solid brass connection fittings, you will never experience corrosion and faults with it. Moreover, it even has quality made silicone rubber jet nozzles that are easily tweaked for their settings and power. The 6.58 foot hose made of stainless steel is durable and flexible, and is also self-cleaning. It has a flow rate of 2.5 gpm and is backed by 12 months warranty. The only con but not a deal breaker with the YOO.MEE High Pressure is that it does not have a pause or on/off option, but that can mostly be found in higher end shower heads, anyway. The Hydroluxe Full Chrome is our step-up pick, which has a 4-inch chrome face that is wide enough to accommodate most raining and massaging settings. With an all chrome finish, it adds beauty to any bathroom setting as a fixture. Unlike our top pick, this one has more options, with a total of 5 settings, since it is pricier and has a more advanced technology. Different settings can also be further tweaked with the 3-way water diverter. Moreover, it is easy to use because the 5-foot stainless steel hose is quite flexible. 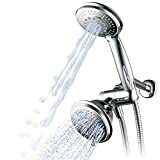 This handheld shower combo can give you a choice of up to 24 water flow patterns due to the customizability of the whole unit, which has a circular shape for the head. It also has an anti-swivel lock nut for the unit to stay in place whenever you need it to stay that way. It has easy to rub clean jets and a flow rate of 2.5 gpm as well. Being an easily wall-mounted unit, each shower can be used on its own or simultaneously. Moreover, it installs without a lot of tools needed, making it easy to use. There is also a simple click lever dial with three zones and the overhead bracket is adjustable on its angle. This bathroom fixture is backed by a good 10 year warranty. Our budget pick is the AquaDance High Pressure, which has a total of 6 full water spray settings for you to choose from, and even has a water saving pause mode so that you can pause whenever you need to shampoo your hair. It can give you high pressure for your water source, regardless of your pipeline, and it has a circular shaped fixture that will mostly complement your other fixtures in the bathroom. With its hands-free operation, you can be able to do many other things in the bathroom. It measures 3.5 inches on its chrome face so it is fair for its size. Moreover, it has a 2.5 gpm water flow rate and a three-zone click-lever dial so that it is easy to operate. In addition to that, the ergonomic grip handle can help reduce user fatigue when you are taking a bath. It is an easily wall-mounted unit that comes with the needed overhead bracket. It has rub-clean jets that are easy to maintain, and it also seems to amplify the water pressure in your home. Made of stainless steel and chrome plated premium ABS material, it is an angle adjustable unit that can withstand daily use. Its included 5-foot stainless steel hose is easy to flex and bend, and it is also easy to change the settings. This unit includes all hardware components like washers and plumber’s tape so that you can set it up easily. In fact, the installation guide has clear/easy instructions for installation. The product is backed by a limited lifetime warranty. 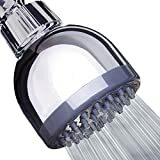 The Camco 43711 is a good choice if you want an on/off switch to help you pause water flow when you do other things like apply shampoo or conditioner to your hair. It can be a great choice for RVs or boats because of this unique water saving feature, which can benefit your trip or vacation in the long run. It also works with most water heaters so you can use it for camping trips and the like. In addition to that, you still get a touch of luxury, as the unit has a total of 5 spray patterns for you to choose from. With a hose length of 9 inches, you can lengthen your reach when you are taking a bath or just rinsing yourself from soap or shampoo. It can be a great deal for most campers or trailers that need a fixture for their bathroom that feels just like home, bearing quick and easy installation. Among the settings, you can choose to have a gentle massage when you spray the water with the jets from the bathroom fixture. In addition to that, like most jets, it has been rated at 2.5 gpm for the water flow rate. It can also be a relaxing and soothing experience due to the rain setting that is present in the unit. It measures a total of 4 inches in diameter, which is fairly large for the unit. If you want a bathroom fixture that has a rainfall setting, you can try the SomovWorld Shower Head. It provides easy installation with no tools needed due to the simplicity of the instructions and the hardware included. It is also made with high quality ABS material with a chrome finish for the parts so it is not too heavy but it is also impact resistant. Moreover, it is worth noting that the swivel ball joint is made with metal and is adjustable so you can feel comfortable with flexible bathroom fixtures like these. It measures 6 inches on the surface so it is really large for a more realistic rain effect. It has a total of 90 powered jets are anti-clogging and made of silicone for added durability and less maintenance. It can also work either on high or low water pressure with its self-cleaning nozzles. There is also a removable water restrictor in this unit for your needs. It can guarantee you an improvement in water pressure and it even has an additional water filter for you to keep your water clean and clear. It has been chrome plated and also includes Teflon tape for the ease of installation for the bathroom fixture unit. 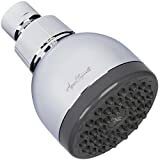 If you want something that has a chrome finish, the DreamSpa 1432 3-way can be a great choice because it is a rainfall shower head that has been equipped with rub-clean jets for ease of cleaning to retain that chrome finish sparkle. It also has multiple settings to choose from, which comprises of 7 settings including rain and massage. Being an easy to install unit, it has a circular shape and a 3-way design so that it looks not only beautiful, but is also functional. The pause works on both heads so you can be able to save more water in the process. Moreover, it has been made with stainless steel and high-grade chrome plated ABS material for its parts, which means that it is quite durable. With a 3-zone click lever dial in its design, it is also rather wide in diameter with a 7 inch chrome face. As a wall-mounted unit that is easy to operate due to the 5-foot stainless steel hose being quite flexible, it has a flow rate of 2.5 gpm. It also comes with conical brass hose nuts that make it rust-free. The unit is backed by a limited lifetime warranty. If you want a bathroom fixture that is great for hotel use, the Speakman S-2005-HB Hotel can be a great choice. It has a quality made polished chrome finish so that it will be able to complement with the rest of the bathroom fixtures that might have been installed in the hotel room. With a total of 5 adjustable jets, your guest can truly customize their bathing experience and make them feel like at home. Because it is a high pressure inducing unit for the flow rate of water, it even has self-cleaning nozzles for ease of maintenance. It even has stream 360-degree turning technology so that you can feel the rain effect in any angle whatsoever. Like most spraying jet systems, it has a 2.5 gpm water flow rate, but you can customize it up to 50 individual streams in just one unit. The bathroom fixture is made with lightweight but durable Speakman engineered plastic. It is also quite adjustable in many ways, including the 8 pulsating massage sprays. The unit works even under low water pressure for most homes, RVs, motor homes, boats and the like, and is backed by a limited lifetime warranty. If you want a unit that has a removable water restrictor, the SomovWorld High Flow can be a great round shaped unit due to the fact that it simulates a real rain effect for a soothing bath experience. Because of the water restrictor, it can be easy to customize the amount of water that goes in your bathroom or area. With a 2.5 gpm water flow rate, it is quite powerful and is also attractive with a chrome finish. It is made with high quality ABS material so that it will not easily deteriorate and corrode unlike other metal parts. It measures 3 inches on its face and it can also be an outdoor shower due to the ease of installation. The unit has a max pressure of 72.5 psi and it has silicone face and nozzles for simplicity and durability as well. Like most units, it can be connected to a standard g1/2 connection thread for ease of installation. In addition to that, it has an adjustable brass swivel ball joint so you can tweak it in a simple way. The Aqua Elegante Chrome can be great for those with motor homes or RVs, and it is made even for low flow homes and pipelines. It can give you a relaxing full force shower and it even has a removable flow limiter for added power for your pressure. Also, because of the self-cleaning nozzles, it gets rid of hard water problems that can be a problem for most RVs and motorhomes. It instantly massages and relaxes the moment you turn it on, and it is made with quality ABS plastic for durability. Because it is ideal for most mobile homes, it only measures 3 inches for the face diameter. It can fit in an apartment just fine due to the ease of installation, while it is still durable due to the brass fittings. With a water flow rate of 2.5 gpm, this unit bears easy installation with a total of 36 nozzles for a great amount of power even in a mobile home. It has a 1/2 inch threaded female connection for ease of putting together and it is backed by a 5-year warranty. With an adjustable bracket, the Briout Handheld is a good unit for the DIY installation method in mind. 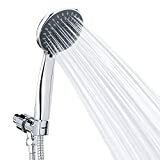 It has a water pressure of about between 20 to 40 psi and it can be a replacement for an old boring shower, if you have been used to a fixed shower with not much action. Because it has a chrome plated surface, it has a beautiful design. The whole unit has five functions for you to choose from, for a customized feel for your relaxing bath time. Its flow rate is about between 1.5 to 3.0 gpm and it can be great and gentle enough for bathing pets and children. It can easily install with almost no problems at all and it can give you a pulse massage within its settings. Its included TPE nozzles have a self-cleaning feature so you can maintain it with great ease. It has a quality ABS plastic material in most of its parts to avoid corrosion and yet still be durable. Installation is simple because it comes with Teflon tape. It is also backed by a lifetime warranty. 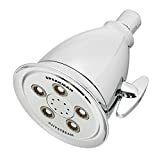 Other shower heads did not qualify in our list as quality bathroom fixtures because they were flimsy in the jet parts and were also not very easy to install. Part of what makes a good shower piece is the durability, and others had corrosion problems. Q: What makes a good shower head? Certain product features make a good showering experience. Water flow or pressure The showerhead should have sufficient water flow, as a pressure shower head with enough spray capabilities. Ease of use Most of these fixtures are easy to use so that you won’t feel frustrated in the bathroom. Functionality Some are water-saving showers, while others are hand-held shower heads. Good price Aside from the good spray, it should also have a decent price that matches its capabilities. Durable parts A pressure shower should have durable parts, better than your average low-flow shower. Water consumption Many modern water-saving shower heads are available today. Settings This includes massage and rain settings, also known as the rain shower. Filtration Some unique shower heads have a filtration process. Q: What’s the difference between a fixed and a handheld or detachable fixture? Portability Fixed ones cannot be taken out of the fixture. Detachable ones or handheld ones can be taken with you due to its flexible hose. Installation Fixed ones can be easier to install. Handheld ones are harder to install due to the overhead bracket. Effectiveness Fixed ones are not that much effective when it comes down to washing. Detachable or handheld ones are more effective for rinsing and washing. Price Fixed ones are not that expensive in general. Handheld ones are usually pricier because of the additional fixtures. Q: What are the different kinds of bathroom products out there? Q: What kind of products can you use to clean up your bathroom? Cleaning your bathroom is important. Liquid glycerin soap – this product is ideal for cleaning soap scum or deposits that are caused by hard water in your bathroom or fixtures. Air burst drain opener – these ones are ideal for clogged drains in both the bathroom and in the kitchen. They can get rid of debris that are stuck in sinks. Lactic acid toilet cleaner – it is mainly used for cleaning the toilet so that it can kill harmful bacteria in your toilet and any nasty build-up on it. Q: Do you need a heater in a bathroom with a shower? Q: How do I keep my bathroom safe when taking a bath? Many bathrooms have grab bars. Consider installing grab bars to prevent slipping. Clean up clutter around your bathtub, if any. Make sure that the bathroom is properly lit. Don’t panic or rush when you’re in the bathroom. Try sitting down with a handheld shower, if possible. Install a shower seat, if possible. Older folks might need an assistant to prevent injuries. Q: Should you take a bath in your period? It is definitely okay to take a bath during your period. A: There have been myths around the world where women are not allowed to take a bath during their menstrual period, but this is not true. In fact, bathing during period is greatly important so that you will not have that sticky feeling or hot feeling that you experience during your period. This is also mandatory for tropical countries where periods are greatly uncomfortable. Q: What are the different kinds of shower heads? Q: What are the different spray types or settings for it? Power Focuses on a very powerful spray of jet, which is great for thick hair. Full body This one is ideal for better coverage and rinsing your body after a bath. Misting This one sprays fine water so that it is gentle to your skin, which is good for babies and pets. Massage This one is great for adults who want a better massage therapy for their body. Rain setting This one makes a similar coverage or downpour much like actual rain. Water saving This one is ideal for RVs, motorhomes and the like, in which you have to save water in the process. Combination spray This one can be used if you want two modes to activate together at the same time. High or low spray This one makes use of the same pattern but with different water flow settings (low and high). Q: What finishes can be chosen for bathroom fixtures? An example of chrome finish. Polished brass – this one is quite expensive to buy, but is quite durable and very easy to clean. They tend to be very stylish and great for traditional homes. Satin brass – this one works well for traditional and modern homes. They are difficult to match, however, but they have a great color and polished finish. Oil rubbed bronze – these are very durable, easy to match, but are quite expensive. They can be found in most higher end homes. Copper – copper is easier to find than most materials, and are naturally antibacterial. They are, however, hard to match with other fixtures. They work well for Tuscan style homes. Satin bronze – they are also expensive but they are easy to maintain and to clean. They can’t easily be ruined by water spots, and are great for Mediterranean style homes. Polished nickel – for those who want a contemporary or modern style, this is a good choice. It may be expensive but is very durable and easy to clean. Brushed nickel – this one might not be the choice if you mostly have stainless steel, but is greatly affordable and does not show fingerprints. Chrome – chrome is generally accepted in all hoe styles, is very versatile, easy to clean, easy to find and quite affordable. The only concern with it is the water spot and the fingerprint problem. Matte black – for a modern choice, black is a good an easy to clean type of material. However, it can be expensive, hard to find and not that popular. White – if you want to match your porcelain fixtures, this is a good choice. It can be prone to damage and chipping, however, as compared to metal materials. Q: How much do Americans consume in a shower on the average? A: Americans consume about 17.2 gallons per 8.2 minutes, on the average. This is if they have the regular flow rate of about 2.1 gallons per minute. Also, it is worth noting that 8.2 minutes is the average time Americans spend bathing. 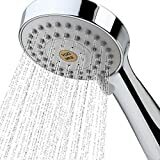 Of course, this number can vary depending on where you live and the water conditions in your area, but showers are indeed quite large consumers for water. Q: How can I save water from using this bathroom fixture? Shorten your bath time to about 5 minutes or so. Don’t put too much cold water if you have a hot water system. Install one that has an on-off or pause switch while shampooing. Q: What are the pros and cons of hot and cold showers? Q: What are the different kinds of water massage for this bathroom fixture? Q: Should I take a bath after massages? A: It depends on your preferences, and what the massage parlor tells you. Most will tell that you may lose the massage oils if you take a bath right away, so they will give you a set time period, such as the next 24 hours, in order to finally take a bath. Q: Most showers will need a water heater. How do you choose the right one? Hybrid – it uses air to absorb heat, and is usually easier to install and to maintain. They are energy-efficient but are not that suitable for extremely cold weather. Tankless – this one makes the use of heating coils for heating up the water whenever you want to take a warm bath. Tank water heater – this one is great for extremely cold water, and has a great amount of water volume processing. It also prevents heat loss due to its construction. Solar powered – this one is powered by the son, but it is only usable when there is enough sunlight in your area. It is mostly ideal only for backup to an existing water heater. Know the warranty policy. You should know what is covered by the warranty, which parts can be replaced, the service center of the company, the return policies, the return period and many other aspects of the warranty policy. Look for a sufficient gallon capacity. You should consider the capacity that is right for your needs. Don’t get one that is too little for your family, or too much, because it can possibly waste energy and water in the long run, or give you inconvenience in the process. Don’t be tempted by low prices. Make sure that if you do buy a cheap one, it still has sufficient features. Heaters usually cost between $700 to $2,000 depending on the type. Make sure you also know if the installation fee is included. Know the fuel type. Most heaters can either be natural gas, electricity, fuel oil or solar energy. Choose which fuel type you think is more affordable or if not, easily accessible. Natural gas seems to be the choice for most people because of the low costs and eco-friendliness. Invest in one that has energy efficient properties. Look for one with a good EF rating and don’t go for something that has too much power or flow so that it will not be costly in your monthly bill. Just buy the appropriate power for your needs. Q: Shower heads often come with other bathroom fixtures like the toilet. How do I make sure that the toilet I buy is also worth it? Design of the seat Most will either have elongated or round seats. Construction You can choose from either one-piece or two-piece toilets. Metal finishes To match your shower head with your toilet, you should consider the metal finish to be similar, e.g. chrome or brass finish. Maintenance You should consider one that is easy to maintain and to clean. Flush design Most will have a flush design that is the lever type, while others have a modern button-type. Water saving Like your shower head, you should consider one that has water saving features as well. Q: Shower heads can also be complemented with a bath pillow during bath time. What are its important properties that you should look into? It should be non slip in terms of attachment and lying down on it. The size should be just right for your head. Its materials should be durable, tear resistant and can withstand water pressure. Of course, it should be waterproof and will not easily develop mold. It should be easy to clean after you have used it for a long time. Q: Shower heads are for shampooing. What makes up a shampoo formulation? Most shampoos can be made of different ingredients. Detergents This is mostly made of synthetic ingredients like cleansers, syndets and the like. They can either be oil-based or water-based. Natural detergents These ones are natural detergents so that they can be healthy for the hair. They usually come in fruit extracts and natural ingredients from plants. Conditioners These ones can come in the form of glycol, animal protein, glycerin, dimethicone and various ingredients, which are mostly chemical or lab based. They are helpful in repairing dry or damaged hair so that you won’t have split ends. Thickeners These can help the shampoo become thicker in appearance. They are mostly in the form of sodium chloride, glycol distearate or PEG-150 distearate. Foaming agents Any shampoo without foam is kind of not a shampoo at all. To help make it foam, such agents are used, such as cocodiethanolamide. Preservatives These help keep out harmful bacteria in the formulation so that it stays fresh with a longer expiration date. Q: After bathing, what’s the best towel to look for? What are the criteria? Towels are important bathroom accessories. It should be highly absorbent. It should be comfortable in its material. You should look for something that is durable. You should also consider the type of fabric used. Keep something that is large enough for you to use. 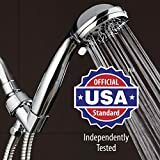 Overall, we conclude that the YOO.MEE High Pressure is our pick for the best shower head due to the good pressure of 2.5 gpm, the ability to amplify your low pressure at home or anywhere, the ease of changing between the 3 functions and the simple and straightforward installation methods for it.